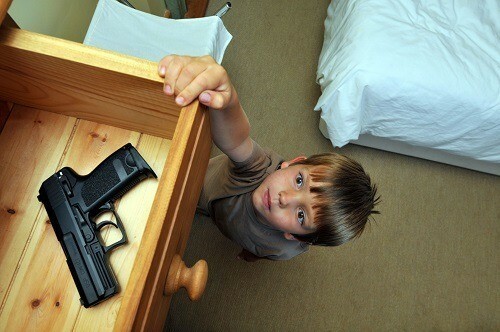 A gun safe is an excellent way to keep your family safe. 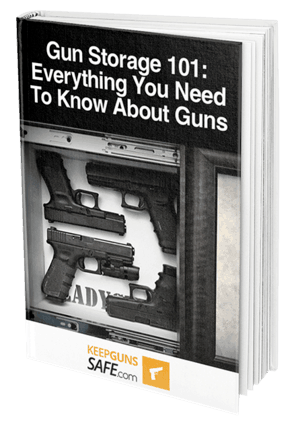 It protects you from negligent discharges from untrained individuals in your household as well as keeping you safe from would be gun thieves. When deciding on the best gun safe ever for your needs, the question of the best locking mechanism will eventually come up. There are several types of locking mechanisms which are typically found on gun storage products such as gun safes and gun cabinets. One type of locking mechanism is the traditional lock and key design. This has the advantage regarding price, but it leaves you at a disadvantage because you need to have the key to open the gun safe. Another typical option is a dial, which is popular with safes featuring mechanical locks. This has the disadvantage of being difficult to use when you are under duress, as it takes a long time to open and requires deft, confident movements, something which is difficult in a life or death situation. One of the most common ways to lock a gun safe is the use of a digital keypad containing a programmable combination. These numerical keypads are also commonly seen in gun cases in our best cases for guns review article. Programmable gun locks are good options because it allows you to use a combination that you will remember best. It also provides a reasonable degree of speed when it comes to quick access. Out of all of these locking methods, there is one which is superior to every other option regarding convenience, speed, and technology. Today, we will be taking a look at biometric locks, and why they are the best choice of a lock, you can opt for when it comes to ​choosing the best possible gun safe. A biometric lock is a lock with a fingerprint scanner. ​These locks use your fingerprint to identify you to allow you to unlock them. Some biometric locks will unlock once you have pressed your finger to the reader while others will require a second step, such as keying in a passcode. As years go by, biometric technology ​further and further, making it easier to implement and more affordable to install in all sorts of different products, including gun safes​. Biometric technology makes up only half of the locking system, however. There is still an actual locking component which is controlled by your fingerprint, whether it be a magnetic lock or a multipoint lock. A biometric lock is only as strong as its weakest link and, in most cases, this tends to be the lock itself. This is why it is important to invest in a safe which features not only a biometric lock but sufficient build quality to back it up. Do not make the mistake of thinking that your safe needs to be unlocked to be infiltrated, a fancy lock will never compensate for a safe﻿﻿﻿ lacking in durability. Biometric screening makes for a lock which will work in most ideal circumstances but will not allow another person to enter if they are not recognized. Locks of this type often include a memory bank into which you can save a variety of different fingerprints so that others can use it as well. Why Opt For A Biometric Gun Safe? A biometric lock is an excellent choice for a gun safe due to several reasons. 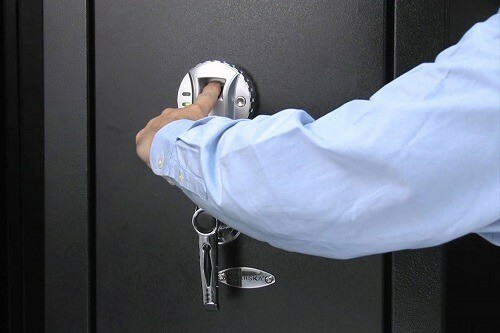 The first reason is that it is simply the most convenient type of lock, not only for gun safes but for a wide variety of products which need to be locked for security reasons. They are convenient because all that is required to open them is for you to press your finger against the sensing pad to be scanned. This makes them quick in addition to being convenient. This speed is ideal for a home defense situation in which you may need quick access to your gun, but you cannot type in a keypad or use a dial due to shaking hands. When coupled with a quick access door, you will find that a biometric lock is the quickest way to get to your gun when you may need it most. Biometric locks have the disadvantage of being unusable by unauthorized individuals, so you can't just give your keys to your friend or let them know the combination. While this makes them poorly suited for a car door or a home, this makes a biometric lock an ideal choice for a gun safe. One question that we often hear is related to the reliability of biometric locks. After all, if you may be trusting this technology with your life, it helps to know a little bit more about just how reliable it is. Doubts about fingerprint scanning technology are reasonable, especially since it is relatively new. You can rest easy knowing that biometric locks are highly reliable, even when your fingers are sweaty and sometimes even when they are dirty. For times when the battery gives out, or your biometric lock cannot properly scan your finger, you can always use a backup locking mechanism such as a keypad or an override key. 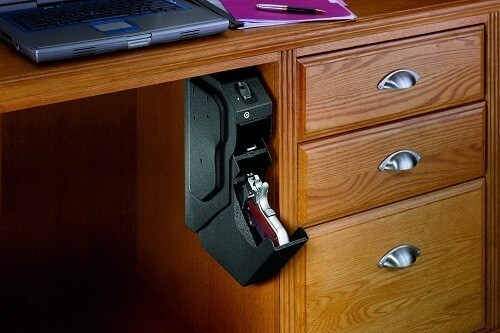 This ensures that you will always have access to your gun. Often, a biometric lock will not be reliable because there was a misinterpretation of the instructions. Be sure to carefully read the manual for how you should press your finger against the lock when programming your fingerprint as well as when you use it day to day. We hope that this guide to biometric technology has proved educational and comprehensive. As you can see, biometric locks are not a technology of the future, in fact, they are the technology of the present. As these locks get more and more sophisticated, we may one day end up seeing them replacing keys altogether.